Agilent Technologies has announced the availability of key enhancements to its Signal Studio for 3GPP LTE and 89600 Vector Signal Analysis (VSA) software. The Signal Studio software runs on Agilent's signal generators and emulators. The VSA software runs on Agilent's analysis platforms. Geared toward engineers performing design and verification of LTE components and evolved Node B (eNB) and user equipment (UE) transmitters and receivers, the new capabilities will help engineers keep pace with the evolving LTE standard. The enhancements will also allow engineers to more accurately test their designs to standard requirements and beyond. 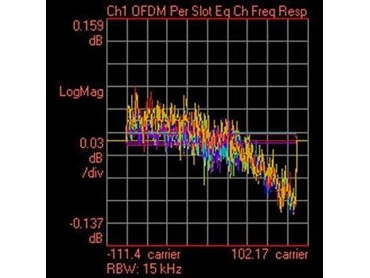 Enhancements to Agilent's Signal Studio 3GPP LTE software for both FDD and TDD include support for the 3GPP December 2009 version of the standard and new features for eNB and UE receiver stimulus. In particular, updated eNB conformance test configurations allow engineers to perform all eNB Rx conformance tests using instruments such as Agilent's PXB baseband generator and channel emulator as well as MXG vector signal generator. Support for automatic downlink DCI channel coding eliminates the tedious task of manually generating DCI messages in downlink signals. Automatic generation and configuration of DCI based on PDSCH allocation, UE power control, UE scheduling and UE random access also is provided. Agilent's 89600 VSA software features a number of new capabilities for LTE modulation analysis including support for the 3GPP December 2009 standard and associated eNB and UE transmitter conformance test updates. New in-band emissions and spectrum flatness traces have been added, both with pre-set limit lines for uplink conformance testing. The software also adds two new analysis tools: The downlink control channel decode and auto-configuration as well as UE-specific resource signal (RS) analysis. Downlink control channel decoding and auto-configuration provides new tables that the engineers can use to verify information sent on the control channel. Designed for LTE TDD, the UE-specific RS analysis allows designers to examine UE RS allocations separately or as a group. Agilent's Signal Studio for 3GPP LTE is a powerful software tool that creates standards-based uplink and downlink LTE signals for use with the Agilent ESG and MXG vector signal generators and PXB baseband generator and channel emulator. The 89600 VSA software is the industry's premier vector signal analysis software for R&D. Providing advanced general-purpose and standards-based tools for evaluating signal spectrum, modulation and time characteristics, it gathers the data needed to find and resolve physical layer signal problems.